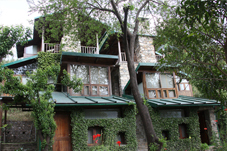 Experience the exquisite beauty of nature at this inimitable eco-friendly best resort in Bhimtal. Enliven your senses as you enjoy a romantic stay with your beloved in a serene atmosphere surrounded by high mountains and lush greenery. Located just above the lake, the resort offers you an incredible view of the entire city. 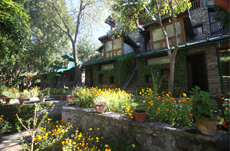 The mesmerizing resort derives its name after the typical solitary rock of the Kumaon belt. Its immaculate architecture done using the unique and traditional Kumaoni stone is an apt depiction of the craftsmanship of Gautam Bhatia and Navin Gupta. After a detailed study of the location, followed by an appropriate architectural plan and execution, Gautam Bhatia and Navin Gupta successfully created a paradise on earth in 1993. For its pristine structure, the resort has also been honored with Indian Architecture Award in 2001. The unmatched structure and proximity to nature made this resort a hub for filmmakers. Moreover, stars like Hrithik Roshan, Preity Zinta, Karishma Kapoor, Sunil Shetty, Dino Morea, Bipasha Basu and Preeti Jhingiyani have also enjoyed a pleasant stay here.